Yesterday was my baby's 17th birthday! No idea where the last 17 years has gone, but I do know they went fast. For her birthday we bought her a Flamingo charm for her Pandora bracelet, she loves Flamingos. I wanted to do something fun to wrap up her gift rather than just give it to her in the Pandora bag. After checking out some store bought embellishments I decided that I could make my own. Now the card I made for her does not match the ensemble but the image is of one of her favourite foods of all time. Really she would like to be a vegetarian, she does not like most meat but she simply cannot live without tacos or hamburgers! Go figure. I bought this Paper Smooches set knowing that she would love this image. She absolutely squealed when she opened the envelope. I am submitting this to the Paper Smooches Sparks Challenge. Love, love, love the birthday ensemble..too cute! And her taco card is perfection! Thanks so much for playing with us at PaperSmooches Sparks! Haha!!! That sentiment is too cute!! Happy Birthday to your "baby" girl! Awesome birthday duo! Who can resist pink & cupcakes? 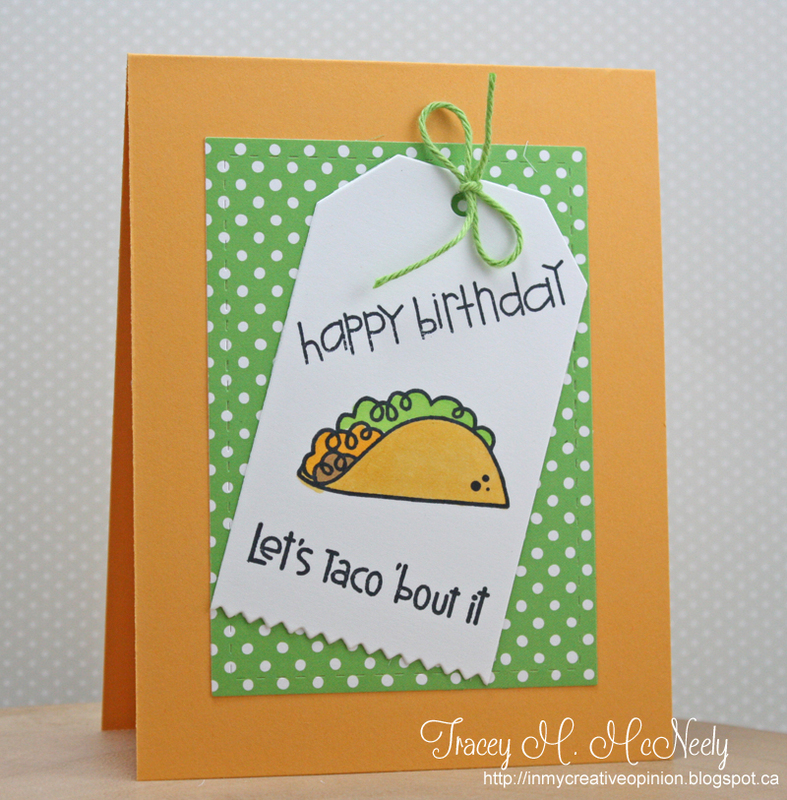 Fun Taco card! Gotta love it when the kids are thrilled with cards their momma's make! Happy birthday to your DD!!! LOVING the goodies for the gift bag and the card! That taco is AWESOME!!! Love the way you decorated Brooklyn's pink bag! That taco card is adorable , nice coloring! How sweet! Love the card and little gift bag! heehee that card is too fun and what a sweet gift bag.. for sure to bring big smiles. It does go by quickly...doesn't it! I love the toothless smile picture you posted on facebook Tracey! Love the cute gift ensemble...there's one of those sweet tags you are so good at making! Such a fun ensemble. LOVE your card too. The HAPPIEST of birthday wishes to your baby girl...they do grow up fast!!! 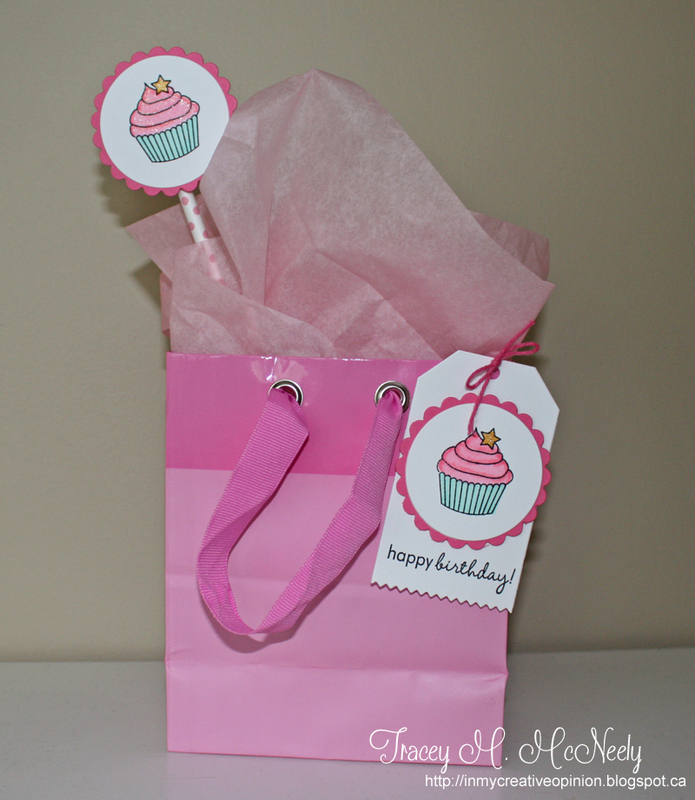 Sweet little gift bag and tag set. And a CUTE card, way to go with the stamp purchase mom!! Awww...happy birthday to your daughter! 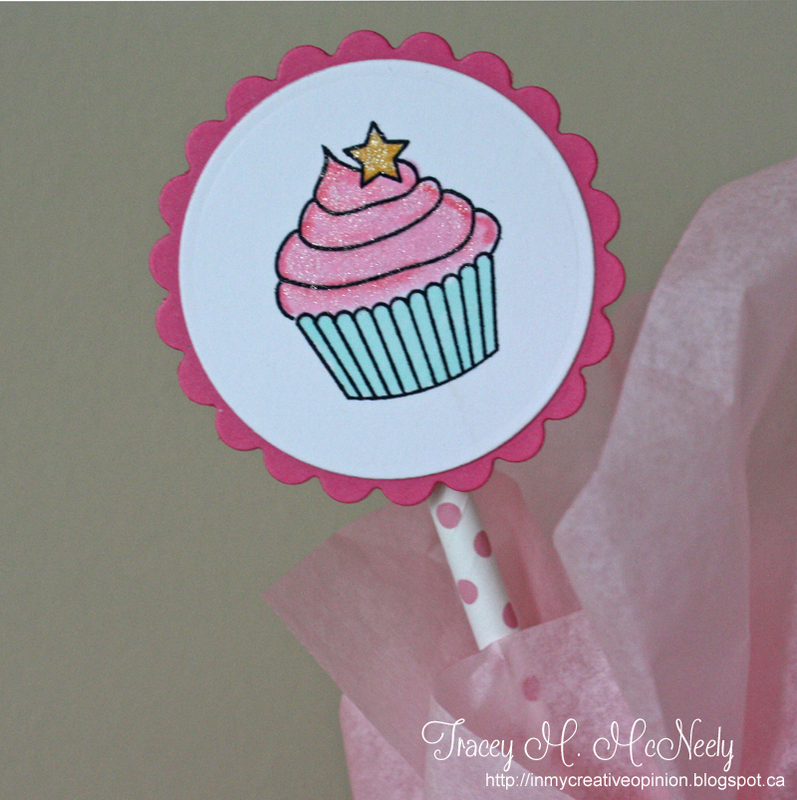 Beautiful gift bag with the cupcakes and the card is just way too CUTE with that sentiment! Sweet cupcakes Tracey. Love the pink hues... oh, that taco looks good to eat! Lovely birthday ensemble for your dd. And the taco card is awesome! Happy Birthday to your sweet daughter. What a fabulous way to package up her gift, and I love the card, too. Yummy tacos. You are so clever, Tracey! I love your 'Flamingo Gift Set' so much...all that beautiful pink, and your 'taco' card is fabulous! Time sure does fly by...Belated Happy B-Day to your daughter! Belated happy birthday to Brooklyn! Your gift set is so sweet and the taco card is adorable! 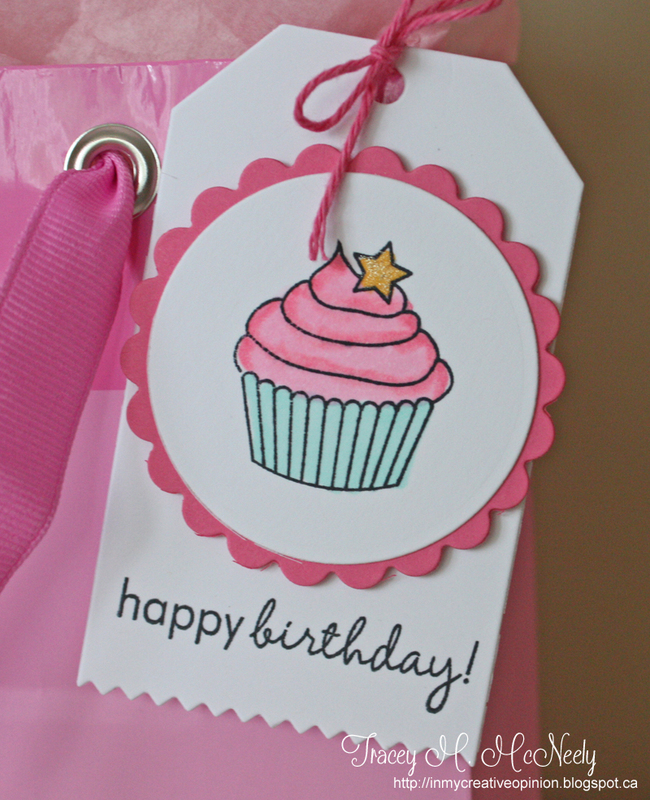 What fun birthday bag and tag!! I bet your daughter adored them, And that TACO card WOW so cute I hope she really flipped over the SUPER cuteness of that card!! Love it!! Happy Birthday to your dear daughter!!! The taco card is so cute. I just love the colors! Thank you so much for sharing your beautiful work with this week's Paper Smooches SPARKS Challenge! Belated Happy Birthday to your daughter (yes, time flies: my niece is already FOUR!!). Your gift of the flamingo charm is wonderful, and the gift ensemble is absolutely delightful. The sparkling cupcakes are yummy; the taco card too much fun! I, too, could easily step into becoming vegetarian, except that I love chicken...Awesome inspiration here!! I'm ever so late, but a BIG happy birthday to your littlest! What a sweet, little package and fun card! Really love those kisses of glitter!